BIG THANKS and lots of LOVE to Travis Houston (my gorgeous husband) and his partner Sandor Cardenas for creating an iTunes podcast for the Delicious Revolution! Despite my blondness, they have made it easy for me to upload the interviews and videos into iTunes. That means you all have access to subscribe and listen whenever you want on your phone, MP3 player or computer. to show up in the iTunes directory the podcast will need subscribers, ratings and comments. 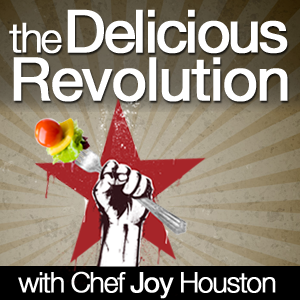 Please take a minute to SUBSCRIBE to the FREE Delicious Revolution Podcast today. While you are in iTunes, rate the show and post a comment. Thank you for your support. If you need help with growing your business presence online, contact Travis and Sandor at Product LaunchR. These guys have made projects that start out seeming technically insurmountable, completely do-able for a layman like me. The work they have done for me on this Delicious Revolution site and on Rocking Body Raw Food have changed my life. I don’t have to travel to teach unless I want to. I have more time with my little son, Maverick and less time in the kitchen classroom. I also have more time to innovate and create NEW books, and classes for people who want more content from me. I never tire or loose my passion for the lessons I give because I get to continue to grow in my raw food education and people who want to learn from me can use the older content to learn. I very humbly thank you Laura-Jane. That is a big compliment considering your place in the community! Thank you for being in the conversation here on The Delicious Revolution with me. What a bummer? Don’t they know I’m half Irish?? What is the subject you are interested in?? Maybe I can help you out individually via email or create a post to address you specific healthy eating questions. At any rate, thank you for trying to check it out. Now a days there are more people are like podcast technology and they want so more entertainment with this technology. So i like this Podcast on iTunes.